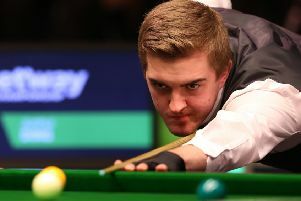 Lothian snooker trio Ross Muir, Michael Leslie and Scott Donaldson all came though the first qualification round of the Shanghai Masters in Barnsley. Muir produced a 100 break in the fourth frame of an excellent 5-1 victory over Malta’s Tony Drago. Leslie made breaks of 58 and 89 in a 5-1 win over England’s Luke Simmonds while Donaldson won the last four frames in a 5-2 defeat of Jordan Brown. Meanwhile, Locarno trio Craig MacGillivray, Robert Carlisle and Ross Vallance join up with Glasgow pair Paul McPhillips and Scott MacFarlane to compete for Scotland in the Home Internationals in Leeds this weekend. Edinburgh pair Seb Zajko (U21s) and Dean Young (U16s) make their debuts.